Cory has been playing music for twenty years, and teaching music for over ten. Being a multi-instrumentalist, his lessons extend to voice, guitar, ukulele, piano, and songwriting. He earned his Fine Art Degree from NSCAD University in Halifax, NS, and a degree in Cognitive Science at York University, Toronto. His interests in cognition and creativity have allowed him to craft unique teaching methods that tailor to his student’s needs. He has ample experience in teaching students with behavioural and cognitive disabilities. Cory studied in the Jazz Voice program at St Francis Xavier University in Antigonish, Nova Scotia. He has worked with students of all ages in individual and group settings to develop their voices. While his lessons are not genre specific, all students will engage in learning to sight sing (reading and singing written music notation), ear training, vigorous vocal training exercises to develop the voice, and in developing a solid repertoire of performance pieces. Guitar has been a special passion in Cory’s teaching experience. 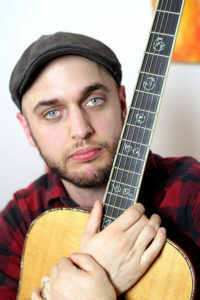 While he specializes in fingerstyle music, he provides lessons in both acoustic and electric styles to all ages. Guitar students engage with many music-oriented exercises specifically developed for the kind of musical insight required for expert guitar players. They will be challenged to memorize musical pieces and given the hands-on experience needed to develop the ability to improvise and play by ear. Students learn their music theory alongside the practical aspects of playing the guitar. Ukulele students will learn to read and memorize music, strum chords to their favourite songs and even write their own! After completing an introductory method course in ukulele, Cory’s students often progress to a specialized genre program such as Jazz or Rock. Many students who begin with ukulele also have great success on later on with other stringed instruments, due to their studies on the Ukulele. Piano students will engage with a progressive method which incorporates all aspects of theory and practical performance. Cory has developed two programs specialized for Adults and Children which move at the appropriate pace. They will learn to read music, play chords and melodies, and have the option to prepare for music examinations. As a songwriter, he had released his album titled “Where We Live” in 2014. He continues to write music and is currently undergoing two recording projects in the city of Toronto. Because of his many stylistic influences, he is described as a multi-genre artist. It is his conviction that genre does not define song. It is for this reason that Cory immerses his students into many styles of music and novel uses of sound, with the intention of fostering robust and creative musical artists. Bio-Musicology: The Advantages of A Comparative Analysis of Musical Capacities Across Species for Musical Pedagogy. Discussing the benefits of Bio-Musicology for Music Education. Attention: The Gateway to Conscious Experience. A Review of Jesse Prinz’s AIR Theory of Consciousness.